Difficulty climbing the stairs is not relegated to the interior of a home or commercial buildings. Front steps, covered with ice in the winter but still difficult to climb in spring and summer, are an obstacle for members of your family, the elderly, or clients with a disability. Rather than keep others out or make entrance far more difficult, install one of our residential or commercial outdoor stair lifts. Indy Stair lifts makes it easy to mobilize your porch stairs in rain, snow, or sleet with outdoor stair lifts. The Indy Outdoor Stair Lift withstands exposure to storms and seasonal change and provides mobility in all kinds of weather. It is easily installed to either side of a staircase and mounts directly to the stairs instead of a wall. 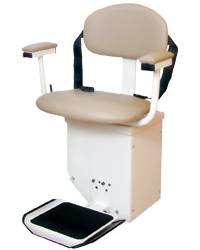 Our outdoor stair lifts comes with the features of standard indoor stair lifts, including sensors and a swivel seat, and accommodate up to 350 pounds. The Indy Outdoor Stair Lift makes your home accessible all around. It withstands storms, seasons and years of use. It’s protected from the elements by weather-tight covers and provides comfort with a 19-inch wide seat that swivels 90 degrees for easy entry and exit. You can call right now for more information about the complete line of Indy Stair Lifts models for straight and curved stairways, from the Indy Pinnacle to the Indy Curve as well as our Outdoor Stair Lift model. Every Indy Outdoor Stair Lift comes with a weather-tight component cover, header cover and seat and unit cover. These standard features help to ensure the Indy Outdoor’s longevity and protection. Call us today for more information about our outdoor stair lifts, our licensed and certified installation service and the best prices on the outdoor stair lifts that will increase the enjoyment of your porch.